I am going to show you the easiest way to reduce net basis upon entry. For investors in the Information Technology sector, or more specifically perhaps the semiconductor industry, maybe not... because the beatings have definitely continued. The poster child for the group would at this point be high end provider of GPUs for the gaming, cloud and autonomous vehicle industries, Nvidia (NVDA - Get Report) . Apparently some investors must have waited until the weekend to go over that firm's earnings call and related forward looking guidance. Others may be reacting to the Heard on the Street column at the Wall Street Journal's website on Sunday. That column seemed to imply that clearing out Nvidia's inventory of gaming chips could take longer than expected. Of course, not all chip makers are the same, and don't even compete for the same customer dollars. That said, they all rely upon demand for technology, and China is a significant part of that. How about memory chips? 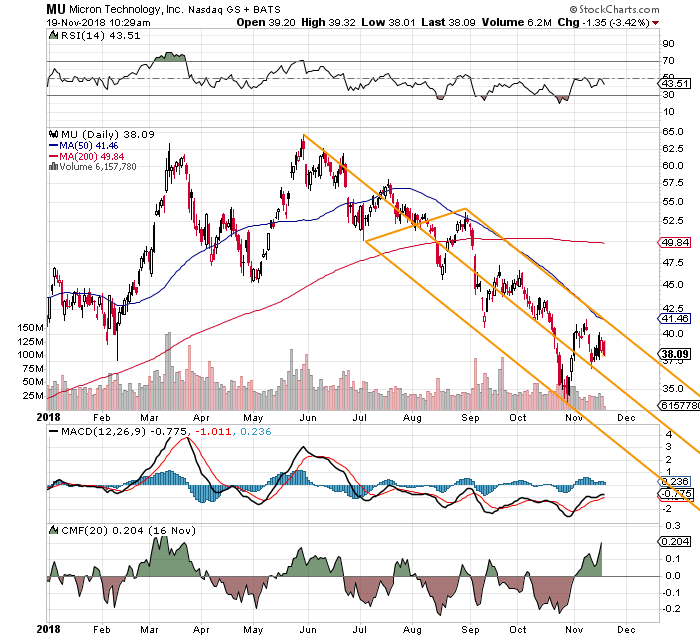 How bad will it get for this group, in particular Micron (MU - Get Report) ? The stock remains dirt cheap in terms of both trailing earnings per share as well as forward looking earnings at around four times. It's more than "just" swirling reports of production cuts for Apple's (AAPL - Get Report) stable of iPhones. While sector rotation has been no friend to Micron, neither has the news cycle, and not just on pricing. Just this morning, headlines broke across the space that according to Trendforce's DRAMeXchange, demand for Flash memory in the third quarter had failed to keep up with production. This kind of negative news impacts firms like Western Digital (WDC - Get Report) because they are far more reliant upon Flash than they are DRAM. That much is true. Micron is far more heavily dependent upon DRAM than Flash to drive sales by almost three to one. Well, just so those who supply DRAM chips to planet earth would not feel left out, officials in Beijing, China have made a statement regarding their anti-monopoly investigation into Samsung (SSNLF , SK Hyni and Micron. According to the statement, progress has been made that has yielded "massive evidence." Keep in mind that these three firms provide for more than 95% of the planet's demand for DRAM memory chips. Was this investigation provoked by the trade conflict? My guess is that we'll never know, but Micron is a U.S. firm, and the other two are South Korean. Whatever you or I think, this does not help the share price of Micron. Eventually. Especially if the G-20 produces a friendly headline at the end of the month. My thought here is that at these valuations, Micron is fine as a medium to long term investment. The bad news is that I have told you that before, when the name traded at higher prices. If an investor only purchased the equity, without playing any of the ancillary games that trading tech names requires, then those investors got hurt. I am long the stock. My net basis as I write this piece is down to $36.06, as I am short both out of the money puts and calls. I am comfortable with my level of risk, however, for the retail trader who might be a little new to the world of trading in and out of options, I am going to show you the easiest way to reduce net basis upon entry. Then I'll show you a baby step that takes it just a little further. Right now, as illustrated by the Pitchfork model, the trend is no friend to Micron. The stocks pretty much broke after being hit with a "death cross" in late September. That said, the daily MACD, Money Flow, and even Relative Strength have improved since, even if the shares muddle along toward the bottom of the chart. One should probably take notice how violently the name reacted to touching the lower trend line of that Pitchfork in late October. That means the algos are aware of the formation. First line of resistance shows between $40 and $41 in my opinion. Then if the fates allow, it will be on to $45. That's the first Fib level on a bounce. At least one thing you do know is this firm is buying their own shares outside of you. So, if one thinks they are ready to buy Micron into weakness, here is one simple way to go about that. (in minimal lots). Keep in mind that MU reports very early in the season. Those numbers are due on December 20th. -Purchase 100 shares of Micron at or close to the last sale of $38.20. Note: This strategy reduces net basis to $37.12, while capping profit at least in the short term to the possibility of being called away at $42. Note: This strategy added to the trade already in place above, further reduces net basis to $36.13, however also exposes the investor to potentially having to buy another 100 shares at $34. In that case, the trader would be long 200 share at a net basis of $35.07. At the time of publication, Stephen Guilfoyle was Long NVDA, AAPL equity, MU equity, Short NVDA, MU calls, Short MU puts.